The Secretary General of the Islamic-Christian Commission in support of Jerusalem and holy sites, Dr. Hanna Issa, condemned the Israeli Prime Minister Benjamin Netanyahu’s urging for the construction of 300 new settlement units in Bait El outpost and 500 others in Occupied Jerusalem. In a press statement on his Facebook page, Dr. Issa warned of the increasing number of settlements in the West Bank at the expense of the Palestinian lands. 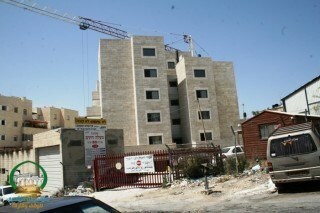 He revealed that the number of the outposts in the West Bank has reached 474 until mid of 2015. Dr. Issa disclosed that the area of the West Bank is 5844 square kilometers. Despite the small size, Israel established so many settlements on its lands for the sake of taking over all of the Palestinian territories. He also stressed that the Israeli Occupation breached the international laws and regulations especially the Geneva Fourth Convention, the international humanitarian law, Hague regulations which all stipulate on protecting the original inhabitants, and the prohibition of transferring them and confiscating their private properties. On Wednesday afternoon, clashes erupted between Israeli forces and young Palestinians who entered the demolition site in the Beit El settlement, as it is originally private Palestinian property taken over by Israeli authorities. The youths said, according to the PNN, that the land was Palestinian property, insisting that the Israeli high court commit to the demolition order of the Draynoff buildings. Soldiers suppressed the angry Palestinians with tear gas, rubber-coated metal bullets and stun grenades. On Tuesday, violent clashes erupted between Israeli police and hundreds of settlers trying to stop the army from demolishing two illegal buildings. The demolition of these buildings followed a High Court of Justice rejection of an appeal from the Beit El seeking to prevent the demolition. In response to the order, the Israeli Prime Minister Benjamin Netanyahu announced approval for immediate construction of 300 more housing units in Beit El. Following the approval for immediate construction, a senior official from the Palestine Liberation Organisation on Wednesday denounced the decision as a “war crime”. “These settlement measures and war crimes are part of a plan by Israeli leaders to impose a ‘Greater Israel’ on historic Palestine and destroy the two-state solution and the chance for peace,” said Hanan Ashrawi in a statement from her office. See: Ashrawi Says Israel Now "Completely Out of Control"
The Israeli occupation forces (IOF) on Wednesday evening notified the demolition of nine Palestinian homes and tents in al-Khalil’s town of Yatta, in the southern West Bank. The IOF patrols rolled into Yatta town and handed nine Palestinian citizens demolition notifications, coordinator for the local anti-settlement committee, Rateb al-Jabour, told the PIC. 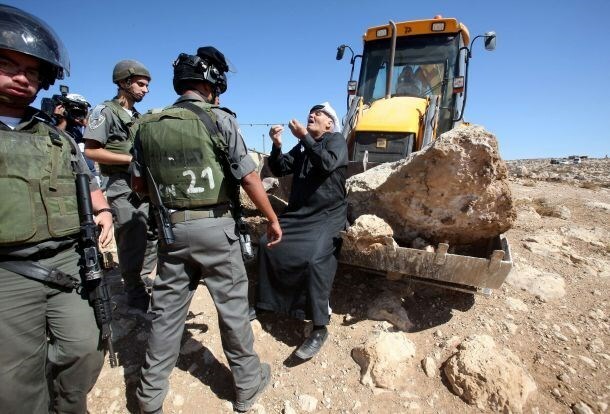 Al-Jabour slammed the Israeli occupation for such tactics of ethnic cleansing perpetrated against Palestinians in al-Khalil as part of ongoing attempts to misappropriate native lands and expand illegal settlement construction at the expense of Palestinians’ own lands and rights. “This is the price we, Palestinians, pay for defending our native soil against Israel’s Judaization schemes,” 58-year-old Khalil Mohamed al-Abbassi, said hours after Israeli bulldozers demolished his home in Jerusalem’s town of Silwan. Al-Abassi spoke out against Israeli intents to deport Palestinian Jerusalemites from their homes so as to wipe out the city’s native character by all means available. Earlier, at dawn Tuesday, Al-Abassi woke up to the sounds of Israeli troops cordoning off his family home and reducing the entire building to rubble. “The Israeli bulldozers knocked down a 100-meter-square apartment and two stores of my own,” he said. “Israeli pressure shall never dampen out spirits; Our holy Jerusalem and al-Aqsa Mosque are just worth our blood, homes, and money,” he added. “History proves that the Israeli occupation has never recognized the rule of law and it will never do,” he stated. 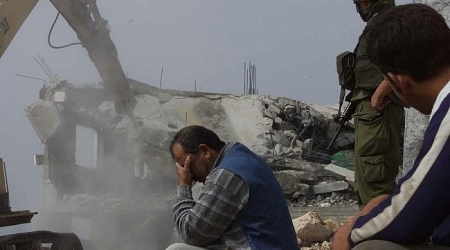 He said the demolition has not been the only one of its kind as Israeli authorities notified the demolition of his family home some 10 years ago. 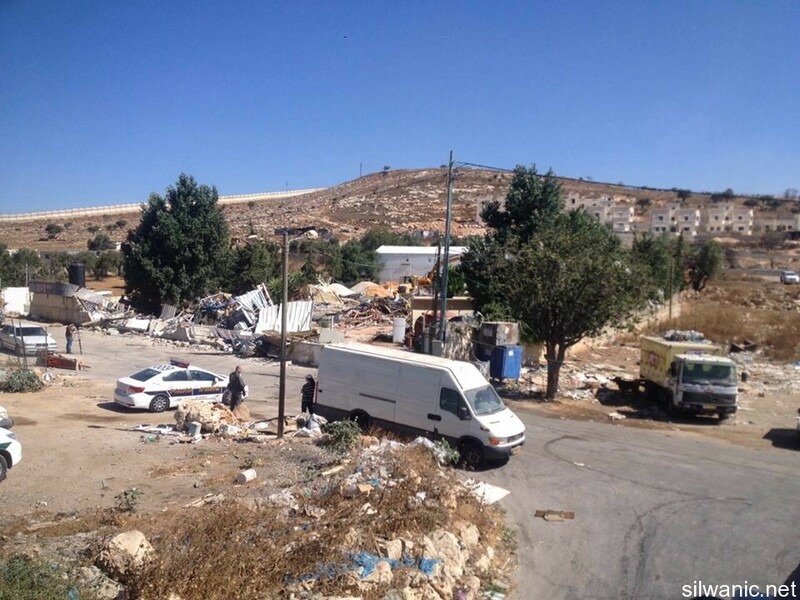 The Wadi Hilweh Information Center in Silwan has reported that the demolitions took place in Wad ad-Dam area, in Beit Hanina. The owner of the buildings, Akram Abu Shalbak, said the structures were built in 2014; some of them had tin roofs, and the others were built with stone roofs. Abu Shalbak added that all of his buildings were officially licensed, and that he concluded all documents and paperwork over two months ago. He also stated that the demolished wedding hall was 500 square meters, and included five ballrooms, six bathrooms and other facilities. The demolitions took place after dozens of soldiers, including undercover units, surrounded the Wad ad-Dam area, beginning in the early morning hours, and then invaded the neighborhood. The Israeli Occupation Forces (IOF) ordered the confiscation of 15 dunums of agricultural lands in Aqraba town in Nablus province for military purposes. The activist Hamza Deiriyeh told the PIC reporter that Israeli forces handed a confiscation notice to the municipality of Aqraba on Tuesday. The order stipulates the confiscation of about 15.65 dunums of the town’s lands. The municipality filed a lawsuit at an Israeli court and has been waiting for the court’s resolution, but the IOF issued the confiscation order before the court’s verdict was issued, Hamza pointed out. Confiscation of the land was done decades ago for military purposes. It has, however, been transformed into agricultural territories for the usage of Jewish settlers in the Northern Jordan Valley. 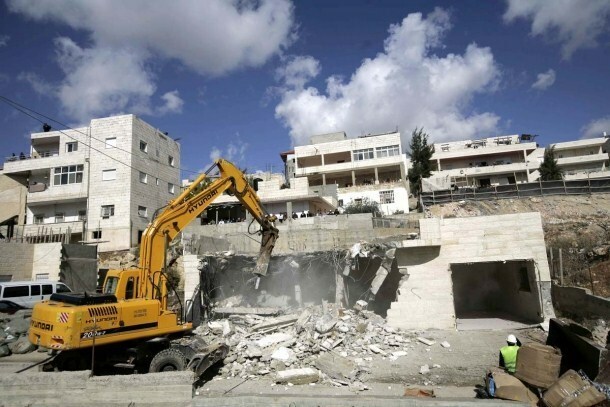 Israeli soldiers invaded, earlier on Tuesday, Silwan town, south of the Al-Aqsa Mosque in occupied East Jerusalem, and demolished residential rooms, stores and warehouses. 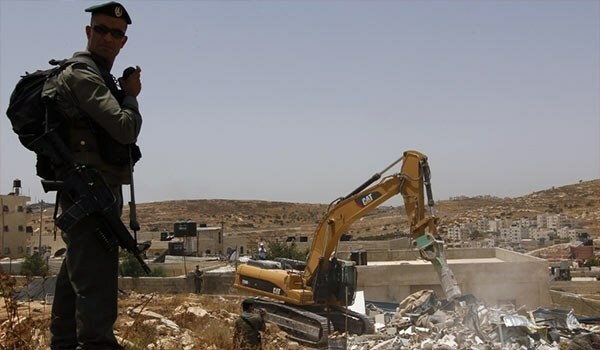 The Wadi Hilweh Information Center in Silwan (Silwanic) has reported that several military vehicles, and bulldozers, invaded the town, and demolished the structures that belong to Eyad al-‘Abbassi, in Ein al-Foqa area in Silwan. The Israeli army said the two residential rooms, two warehouses and a shop were allegedly "built without a construction permit." Silwanic said dozens of soldiers surrounded the entire area before invading it, declared it a closed military zone, and demolished the buildings. The Israeli daily Haaretz has reported that a document released by the Civil Administration Office of the Defense Ministry affirms that Susiya village, in the southern West Bank district of Hebron, is built on private Palestinian property. But in spite of this admission, the Israeli military has stated that they will continue with a plan to demolish the village, and forcibly relocate the Palestinian families who live there. The Jabour and Nawaja families, based in Susiya for hundreds of years, have in their possession ownership documents of their land that date back to the Ottoman empire of the late 1800s. They are among the 40 extended families (around 350 people) who live in Susiya who are facing forced relocation by the Israeli government. The residents of Susiya are caught between conflicting Israeli orders: they have been told that their homes and farms lack the proper construction permits, while at the same time, Israeli officials have been ordered not to issue any construction permits for Palestinian residents of the area because of what the Israeli government termed a “lack of ownership papers”. Although multiple families in the village do have the Ottoman-era ownership papers, the Israeli government had, up to this point, refused to recognize them because the property lines and geographical references were allegedly unclear. But now, an Israeli civil servant assigned to the task of investigating the Palestinian claims of ownership has identified the geographical elements referenced in the original ownership documents, and has confirmed that the families do indeed own the land on which they have lived for generations. The civil servant, Moshe Meiri, presented his findings this week to the Israeli Civil Administration, and concluded that the demolition orders issued against the Jabour and Nawaja families must be rescinded. Despite this finding, the Israeli military has resumed plans to demolish the family homes, barns and stables in Susiya village. The 350 Palestinian residents of the village have been joined by international solidarity activists in a round-the-clock vigil to try to stop the demolitions from proceeding. In 2013, the residents of Susiya had submitted a master plan for the future development of their village, but the Israeli civil administration rejected the plan, saying that the residents should instead be forcibly relocated to allow for the expansion of the illegal Israeli settlements being constructed in the area. The right-wing group Amana filed a case in the Israeli court system to try to push for the demolition of the village. And while the court initially ruled against the residents of Susiya, the court also called for an investigation into the ownership papers, which has now been completed and has confirmed Palestinian ownership of the land. Despite this statement and the most recent findings of the civil servant charged with investigating ownership of the land, the Israeli planning council continues to move forward with a plan to demolish the village and forcibly transfer the residents of Susiya to the town of Yatta nearby. Palestinian villagers and farmers from Salfit have complained that Jewish settlers filled an agricultural water well with dirt and rocks to prevent them from using it to irrigate their lands in Wadi Qana (Qana Valley), west of Deir Istiya town. 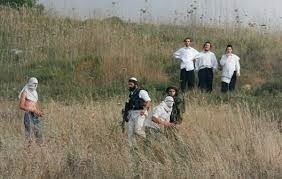 Local sources said that the settlers buried the well with mounds of dirt and rocks and fled the scene. Specialist in settlement affairs Khaled Maali said that the settlers aim to seize the whole area of Wadi Qana and force the famers to leave their lands in order to expand eight settlements encircling the valley. Maali expressed his belief that there is a kind of coordination between the Israeli occupation army and the settlers in the area to expel the farmers from the valley, where the former bars them from working their lands and the latter harasses them by unleashing pigs into their fields. 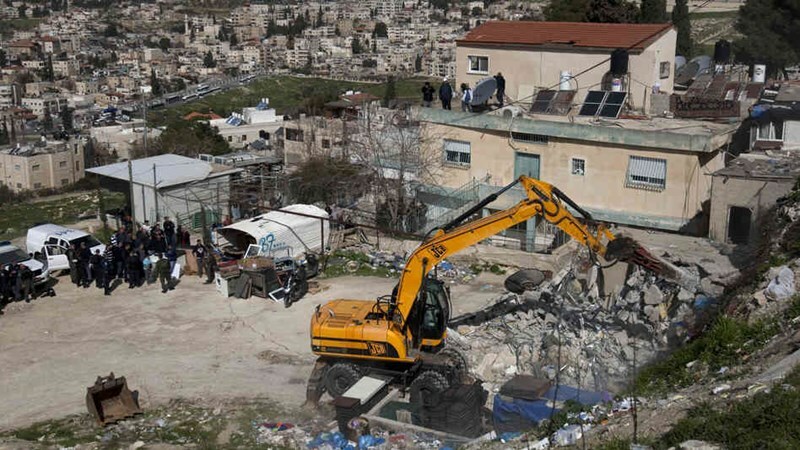 The Israeli occupation authority (IOA) on Thursday started to bulldoze Palestinian plots of land in Ras al-Amoud neighborhood east of the Old City of Jerusalem as a prelude to annexing them to Ma'ale ha-Zeitim settlement. 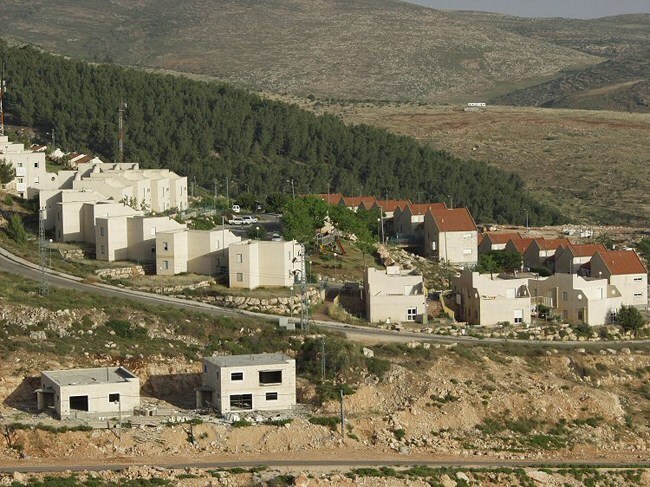 The Israeli district committee for planning and building in occupied Jerusalem had approved earlier this year a plan to expand Ma'ale ha-Zeitim and later chose an Israeli company to carry out the project. The project includes the construction of a building and a religious site for Jewish rituals and will be established on two dunums of land located near the previous police station on the southern side of the settlement. 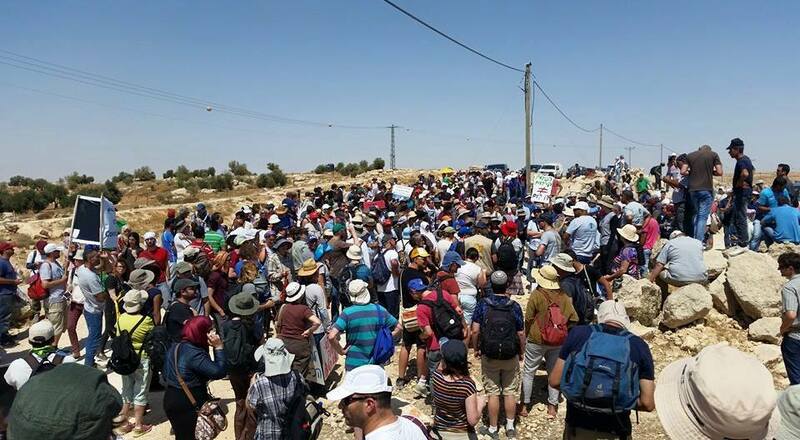 On Friday at 1:30 midday Palestinian villagers were joined by more than 600 Israeli and international supporters to protest the Israeli military decision to demolish half of the homes of Susiya village in the southern Hebron plains south of the west Bank. The decision to demolish the homes of Susiya villagers aims at forcing the residents out of the area to expand the settlement of Susiya originally built on land taken from the local villagers. From the Israeli side the Combatants for Peace movement, CFP, helped in organizing the protest. More than 450 members of CFP took part in the march today. Also members of the popular struggle committees, Palestinian MP Mustafa Al Barghouthi, and a group of Palestinians from Galilee and Jaffa joined protest today. The protesters marched near the homes Israel wants to demolish chanting against the Israeli occupation and held signs demanding the halt of home demolishing policy by Israeli targeting Palestinian villagers. The Israeli human rights groups Rabbis for Human Rights and B'Tselem said, in a statement last week that pressure from Israeli settlers had led to the decision to carry out demolition orders in the village of Khirbet Susiya after Ramadan, although a high court hearing regarding the case is currently scheduled for August 3. “ we are supporting the villagers of Susiya to stop the injustice and human rights violations committed by the Israeli occupations, we believe that the villagers of Susiya have all right to live on their lands and continue their way of life.” Combatants for Peace. The court case has been ongoing since 2012, when residents of Khirbet Susiya applied for the Israeli Civil Administration to approve an outline plan for northern part of the village. Susiya villagers reportedly built homes in 1986 on agricultural land they owned, after being evicted by Israel from their previous dwellings on land declared as an archaeological site. Israeli soldiers invaded, earlier on Friday, several Palestinian neighborhoods in the Old City of occupied East Jerusalem, searched homes, and kidnapped nine Palestinians. 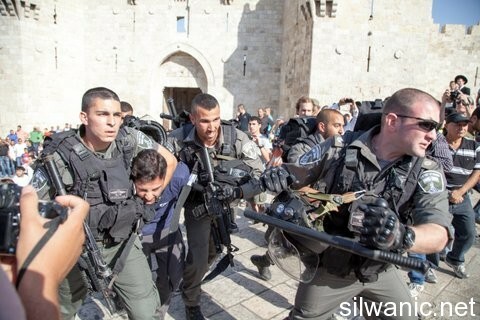 On Thursday evening, soldiers invaded Silwan and broke into home before attempting to kidnap some youths. Amjad Abu Asab, head of the Jerusalem Detainees Families Committee, has reported that the soldiers kidnapped Mohammad Abu Farha, Mohammad Basety, Eyad al-Ghouj, Omar Ibrahim, Ahmad Shaweesh, Abdullah Da’na, Mahmoud Shaweesh, Wahid Bakri and Ma’moun Gheith. 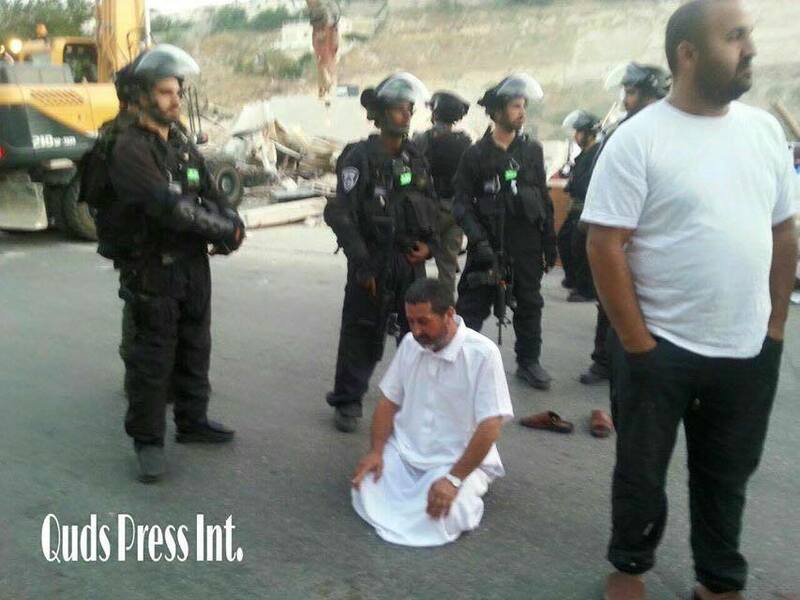 Abu Asab added that the soldiers also handed several young men military orders for interrogation in a number of detention centers, in occupied Jerusalem. 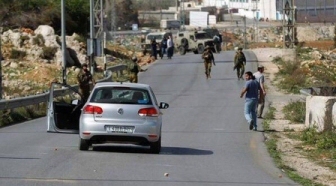 On Thursday evening, undercover soldiers of the Israeli army invaded Ein al-Louza neighborhood in Silwan, and attempted to abduct a number of local youths. The Wadi Hilweh Information Center in Silwan has reported that the undercover soldiers chased several youths and children in the neighborhood, and smashed a door of the local mosque before occupying its rooftop. Soldiers also invaded a land belonging to members of the al-‘Abbasi family, and searched it. On Thursday afternoon, soldiers and personnel of the Jerusalem City Council attached a demolition order to a wall of an under construction home, in Silwan. The 138 square/meter home belongs to members of al-Qaaq family. Earlier on Thursday, soldiers invaded al-‘Abbasiyya neighborhood in Silwan, searched the ruins of a demolished home belonging to Khaled az-Zeer, and kidnapped Hamza az-Zeer. Soldiers also detained Morad al-Ghoul after storming his shop in Ras al-‘Amoud neighborhood.